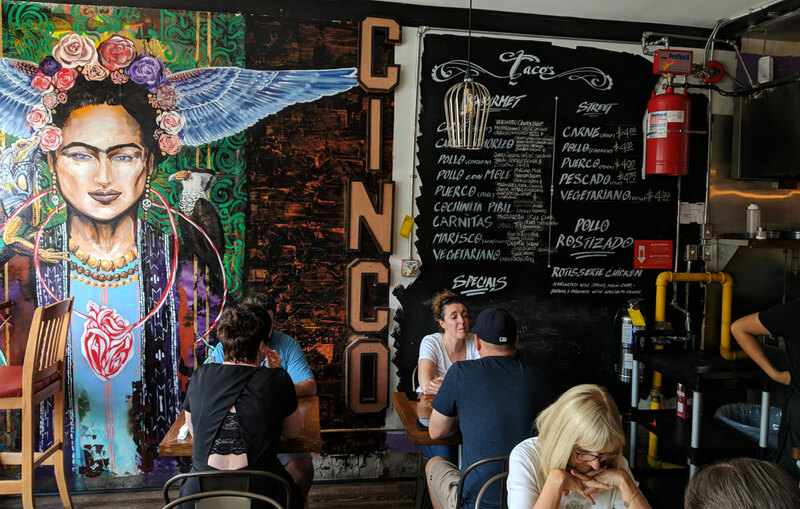 Cinco is an unassuming Mexican restaurant on Roncesvalles that’s been serving up tacos and rotisserie chicken for about a year. Nothing about it particularly stands out, but if you’re in the area, I’m sure you could do worse. It wasn’t bad, though I wish they had taken the same amount of meat and split it into two tacos, because it’s kind of absurd. 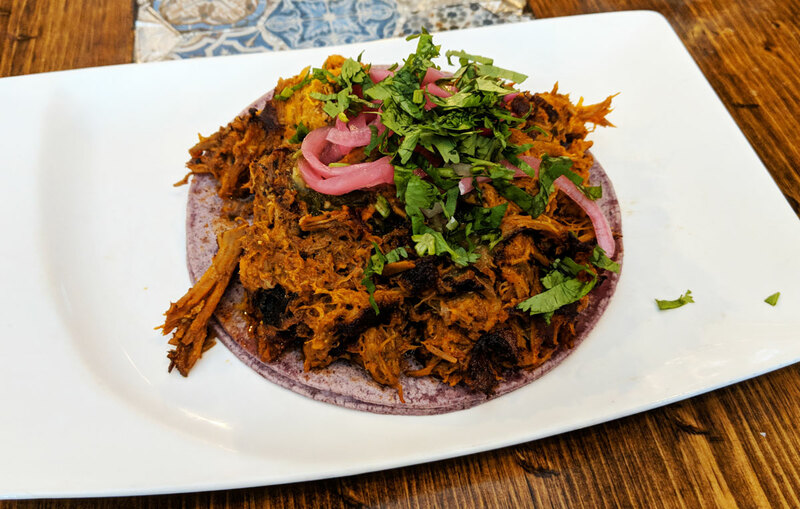 The bites where you get a bit of everything — the shredded pork, the cilantro, the pickled onions — are really good. But there’s such a heaping mound of meat that many (most?) of the mouthfuls are pork, pork, and nothing but pork. 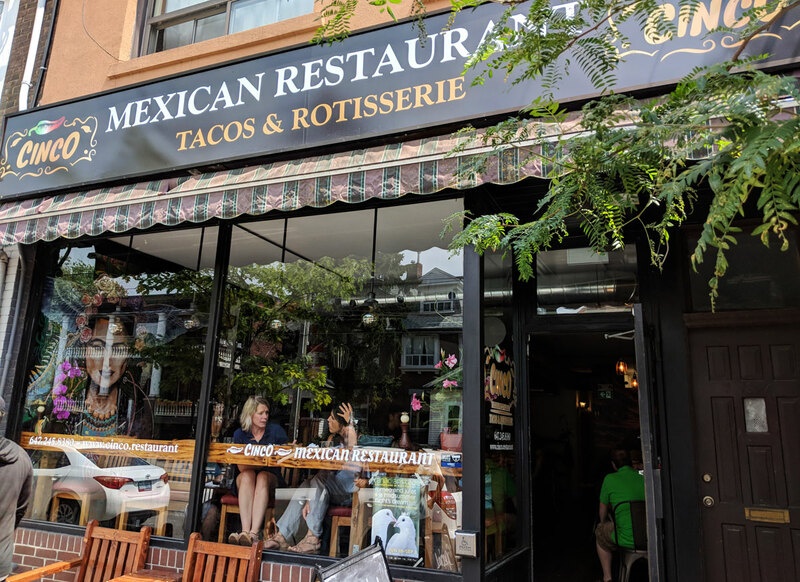 This wouldn’t have necessarily been a bad thing, but the pork was quite dry despite being shockingly greasy (seriously, the amount of oil dripping out of the taco was insane. The entire plate was swimming in it by the time I finished). Still, it was tasty enough — the adobo-braised pork was tasty, the two blue corn tortillas were nice and fresh (the thin layer of cheese between them was a nice touch, but it was a bit too subtle to add much to the overstuffed taco), and the mouthfuls with a bit of everything had a nice balance of richness from the meat and acidity from the pickles. 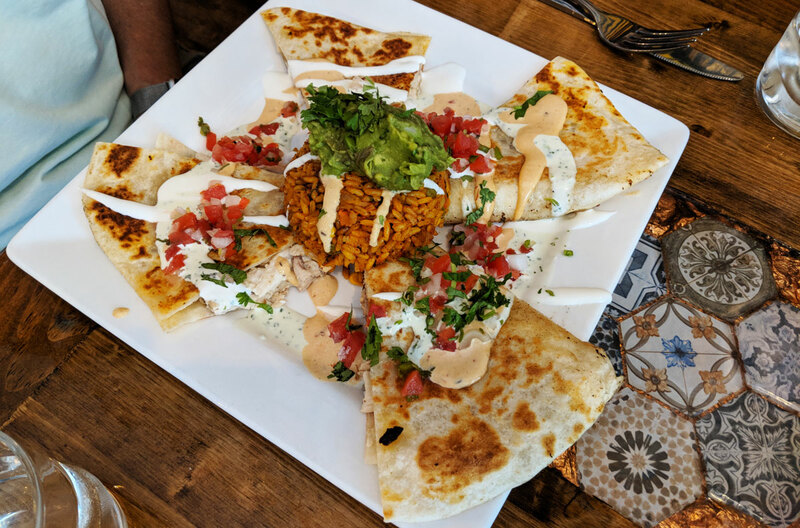 I also tried the the chicken quesadilla, a daily special. This was a bit of a head-scratcher; it was filled with pieces of plain chicken, and… that’s about it. No cheese, no other ingredients (that I could taste, at least), just a whole bunch of stale-tasting chicken chunks. But it was fine, I guess — especially once I started dipping it into the pool of porky grease from the taco.